Wastewater treatment plant is a basic infrastructure in modern society to purify wastewater created by homes and businesses. Its operation is 24 hours a day and wastewater treatment comprises multiple processes to remove solids, organic compounds and other matters. Such a complex workflow needs a careful management and it is insufficient only being supervised by plant personnel. Besides, the source water quality can be changed in an instant and any negligence or mistake may lead to improper treatment or cause environmental pollution. Therefore, the automatic monitoring and control system has been playing a very important role in ensuring the treated effluent to meet the environmental regulations and government criteria before discharging into the sewer or river. 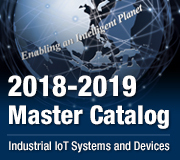 However, how to efficiently create a centralized monitoring and control management system with minimal costs to gain maximum value, how to assure system stability and retain future expansion capability, all of these will be affected by the choice of hardware and software. 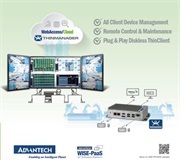 Advantech offers powerful software and extensive hardware portfolio, including advanced WebAccess SCADA software, APAX Programmable Automation Controller with I/O modules and EKI Ethernet switches, enabling System Integrators to quickly complete their wastewater treatment plant projects through one stop shopping without worrying about compatibility. By providing fully redundant functionality, this total solution has maximum reliability to guarantee non-stop operation. Meanwhile, developers can greatly benefit by the WebAccess powerful and ample features to easily obtain data and integrate multiple nodes or platforms to meet project present and future requirements while reducing development and maintenance costs. 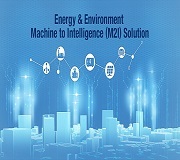 Easy Control Technology is a professional automatic control technology company in Taiwan which specializes in system design, planning and integration for government public construction projects, academic institutions and technology enterprises. Recently, it has won the bid of wastewater treatment plant project of Southern Star land development plan in Kaohsiung Free Trade Zone. In order to provide an optimized configuration of the automatic monitoring and control management system, the company would consolidate dozens of wastewater treatment processes into a master station plus four substations (central control room, pumping station & grit chamber, biological treatment station, rapid/slow mixing & effluent station, chemical control & sludge treatment station). Due to the complexity of this system, Easy Control Technology was looking for a cost-effective integrated solution so as to speed up the project development with less effort. In terms of software, it must have scalable centralized management capability with redundancy feature to complete remote supervisory control and on-site data acquisition without data loss, and has to support open interfaces and Modbus protocol to easily access data and integrate diverse devices as well as providing a wide variety of graphic libraries to represent data via animation in real time. Regarding hardware specifications, supporting Structured Text (ST) language is prerequisite because the company is habitual of using it for programming. Providing backup functions and fast recovery mechanism are also necessary to enhance system reliability. For this wastewater treatment plant project, Advantech provided a total solution that combined WebAccess 8.1 with its APAX-5000 and EKI series products. The installed APAX-5620 RISC-based controller was equipped with various modules for acquiring and delivering digital/analog signals from the four substations to the control center via an EKI-7659C industrial Ethernet switch. The collected data is then displayed using WebAccess, thereby achieving centralized remote monitoring and control management. WebAccess can also be integrated with video cameras or CCTV systems using an EKI-9312P Gigabit PoE switch to support the direct supervision of equipment and facilities. 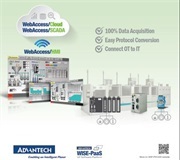 Advantech’s WebAccess platform offers greater functionality than conventional SCADA systems and delivers a wealth of benefits. As a core platform, WebAccess facilitates the centralized management of all SCADA nodes, which run independently, while providing redundant nodes and communication ports to ensure failures do not interrupt system operations. With support for multiple open interfaces, numerous device drivers (via the Modbus protocol), and real-time data connectivity, WebAccess offers superior integration capabilities that ensures programmers can easily perform data exchange or platform access tasks. Furthermore, the provision of several pre-built graphics and customizable functions allows system designers to effortlessly create user interfaces and dynamically updated animations. However, most importantly, WebAccess is a 100% web-based platform that features a private cloud architecture, which allows system configuration and administration to be conducted via a standard web browser and supports real-time data access at any time/location using any desktop or mobile device. Regarding future expansion potential, WebAccess supports both rapid upgrades and comprehensive integration. Considering the hardware, APAX-5620 is a RISC-based controller equipped with an Intel® Marvell® XScale® PXA270 processor and backup/redundancy functions. The APAX-5620 programming environment supports all IEC 61131-3 programming languages (including ST). As a crucial part of the control and monitoring system, the APAX-5620 module and I/Os offer a maximumresponse time of 1 ms to ensure efficient handling of local measurements and events. Featuring powerful built-in communication capabilities, APAX-5620 can be used to easily communicate with multiple WebAccess SCADA nodes. Moreover, with installation of two APAX-5620 modules, the backup/redundancy function can be enabled to enhance the system availability. Finally, by leveraging the X-Ring redundant network protocol and ultra high-speed recovery time (less than 10 ms), EKI-7659C delivers more reliable network communication that ensures timely data delivery. Stepping into the Internet of Things (IoT) era, water/wastewater treatment will not only need automatic monitoring and control, but also need to prepare the functions for the Cloud services. 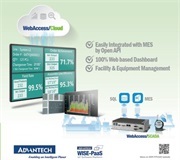 Advantech’s fully web browser-based WebAccess has surpassed general SCADA software in vertical and horizontal integration. Its abundant functions and tools with open architecture not only fulfill the existing system requirements but also take future expansion into consideration. Through this powerful platform, System Integrators are able tosignificantly increase the efficiency of project development and after-sales maintenance. Additionally, Advantech’stotal solution for this project is comprehensive redundancy scheme. Both the software and the hardware such as node, comport, controller and network switch all provide backup configurations which contribute to establishing a highly stable and reliable system operation. The excellent result has enabled Easy Control Technology to continuously use WebAccess solution in the field of water resources.